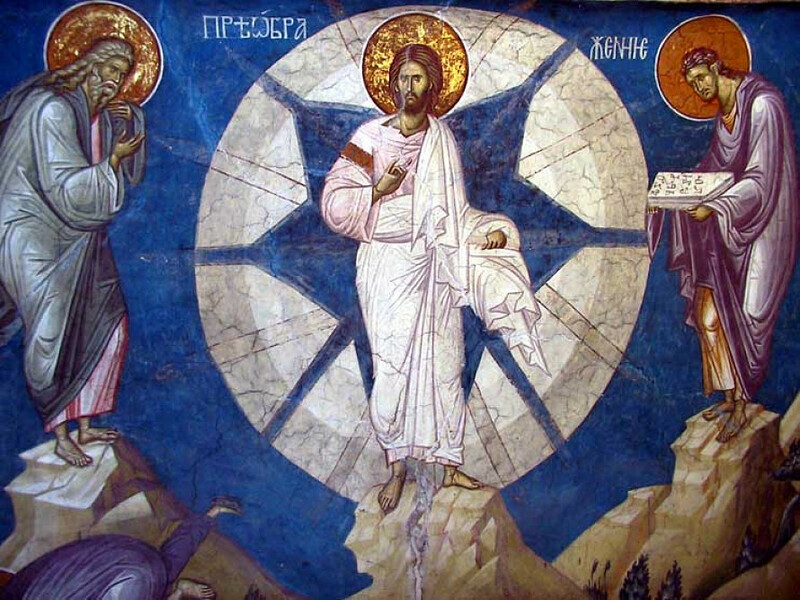 The Holy Transfiguration of Our Lord, God and Saviour Jesus Christ (Second “Feast of the Saviour” in August). Thou wast transfigured on the mountain, O Christ God,/ Who didst show Thy glory unto Thy disciples as far as they could bear it,/ May Thine ever-existing light shine forth also upon us sinners/ through the prayers of the Theotokos.// O Bestower of light, glory be to Thee! On the mountain wast Thou transfigured,/ and Thy disciples beheld Thy glory as far as they could bear it, O Christ God;/ that when they would see Thee crucified,/ they would comprehend that Thy suffering was voluntary,// and proclaim to the world that Thou art of a truth the Effulgence of the Father. Cuando Te transfiguraste, Oh Cristo Dios, en la montaña; Revelaste Tu Gloria a los discípulos según ellos pudieron contemplar. Haz resplandecer Tu Luz Eterna sobre nosotros pecadores; Por las intercesiones de la Madre de Dios; ¡Tú que otorgas la luz, gloria a ti! ما تجلّيت أيها المسيح الإله في الجبل، أظهرتَ مجدك للتلاميذ حسبما استطاعوا، فأشرق لنا نحن الخطأة نورك الأزلي، بشفاعات والدة الإله، يا مانح النور المجد لك. ukazując chwałę swoją Twoim uczniom, na ile ujrzeć mogli. przez modlitwy Bogurodzicy, Światłości dawco, chwała Tobie. This entry was posted in 12 Great Feasts, Festivals, Liturgical Music and tagged 2018, Feast Day, Holy Transfiguration of Our Lord, Orthodox Christianity. Bookmark the permalink.